With the haunting lyrics of a song that refers to a lynching sung in the background, a group of African-American Catholics in Los Angeles gathered in mid-August to meditate on the fatal shootings of unarmed black men and boys, linking their suffering to the persecution and crucifixion of Jesus. The approximately 150 participants prayed and remembered Oscar Grant, Tamir Rice, Trayvon Martin, Rodney King and the circumstances that led them and other people of color in the U.S. to be beaten or killed. After a gunman opened fire July 7 in Dallas, killing five police officers in a presumed act of retaliation for the killings of a black man in Louisiana and another in Minnesota earlier that week, all the attention shifted to police, Race said. Discussion about the killings of Alton Sterling and Philando Castile, whose deaths were caught on video, ceased, “as if it didn’t happen,” he told Catholic News Service, and it was painful to see that one set of lives lost was considered a national tragedy but other lives lost were not given the same importance. This summer, as tensions boiled over following a string of killings of black men, the lingering pain indented by racism in the U.S. has once again been brought to the forefront. It rapidly became an issue that had to be addressed in the presidential election season. The two major presidential candidates in the country have recently made much of the issue while campaigning and in their official party platforms. Yet, at the national level, some feel that “there hasn’t been enough response in the way that African-American people would like,” to address racism and also the brutality, past and present, associated with it, said Race. 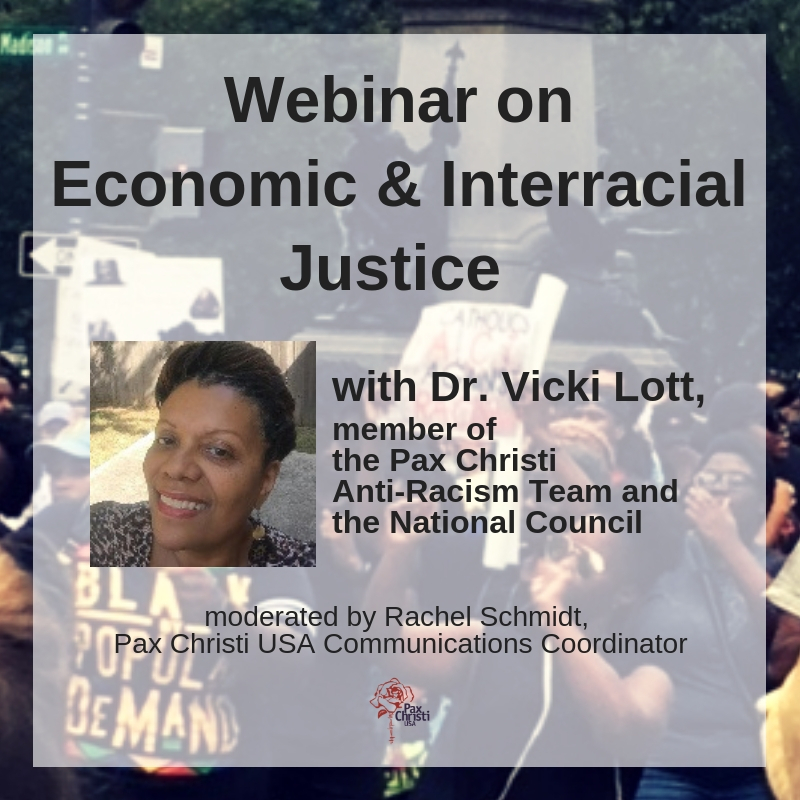 That’s because racism is an issue that is difficult for many to address, even for communities that have experienced racism historically and consistently, said Sr. Patricia Chappell, executive director of Pax Christi USA in Washington. “There are the communities where we know that there have been disparities. We know they have experienced inadequate education. We know that in these communities decent and affordable housing have not necessarily been an option for them. We know that in these communities, access to decent health care has not been there. We also know that it’s unfortunate that oftentimes within these communities, the relationship with police has not been positive,” she said. Add to that mix the brutal history of slavery and other traumatic experiences of black people in the history of the country, and you encounter people who have felt dehumanized, said Sister Chappell. Sr. Anne-Louise Nadeau, director of programs for Pax Christi USA, said that while slavery and other painful events suffered by black people in the country took place in the past, its pain “is stored in the psyche,” and it doesn’t help to live a society that has ways to go before equality becomes a reality. Because of all those circumstances, said Chappell, who like Nadeau is a Sister of Notre Dame de Namur, the pain manifested this summer is not just about the recent killings. To confront some of that pain, Race and eight other black deacons from the Los Angeles archdiocese, meditated on that history while leading others in prayer that August afternoon in outdoor Stations of the Cross that the neighborhood witnessed. A choir sang “Strange Fruit,” a poem that later became a song and whose “Southern trees bear a strange fruit, blood on the leaves and blood at the root” lyrics reference lynching. When you look at each violent event that innocent black people have suffered, they begin to mirror events in the life of Jesus, Race said. That’s why it helped to meditate on those events when thinking of the recent string of black men killed while also reflecting on Jesus on his way to Calvary, when he was falsely arrested and convicted, and when he was brutally killed by crucifixion, even though he did nothing wrong, he said. He also thought of Mary, reflected on her pain as she saw her son brutally murdered, much in the same way that many black women are seen mourning for sons or husbands killed. Archbishop Wilton Gregory of Atlanta wrote in an Aug. 4 column for The Georgia Bulletin, the archdiocesan newspaper, that “violence lately has become so commonplace that we risk being desensitized to the brutal killings of persons of color,” as well as of others. “Our Catholic faith and our love for our country must compel us to resolve to address the issues that lie beneath these acts of violence,” he said. The U.S. Conference of Catholic Bishops responded this summer by announcing the creation of a task force to deal with issues of race. It will be headed by Gregory. The bishops have in the past addressed the topic in various documents including in “Forming Consciences for Faithful Citizenship,” issued in presidential election years to educate Catholics on their responsibilities as citizens. Chappell said transformation and change in a society can happen and there are good steps being taken toward that. The laity certainly has responded by organizing gatherings and educational activities to understand the issue, she said. And Catholic organizations such as Network, Pax Christi and others have put out voter guides to educate Catholics on how the different candidates stand on various issues, including racism. But the church’s hierarchy also needs to acknowledge and do something about the problem, she said.